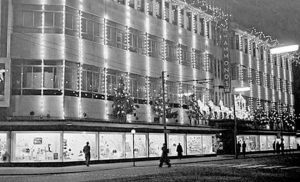 Hammonds, Hull’s iconic department store sails like a great ocean liner on Paragon Square. 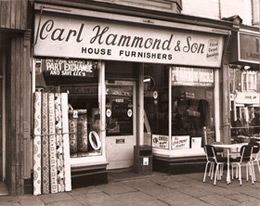 Carl Hammond established his drapery store – selling cloth and individual items – in 1821. Then the city of Hull was very different from now, with a chain of docks and medieval walls but it was a thriving, bustling port. As the city grew, so did the population and his venture went from strength to strength. When Hammonds opened in 1916 it was an example of the best. It had a large dome, like the City Hall and Dock Offices with a big flag pole reaching high in the sky. Shoppers walked into a retail wonderland, glimmering with goods to make clothes with cottons and fabrics from the Haberdashery Department or to deck out hearth and home. Upstairs under a skylight there was a ballroom where people went to dinner-dance. Hammonds destroyed by bombing in the 1941 Hull Blitz. 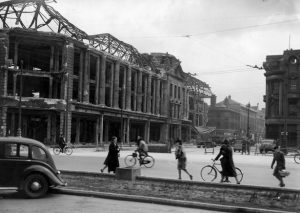 Like many of Hull’s buildings, it suffered in the 1941 Blitz. Taking a direct hit it was reduced to rubble and for years bare bones were all that remained. In 1952 a new building rose like a phoenix from the ashes. Designed by T.P. Bennett the new Hammonds store was as good as the old, with the same level of service, the same goods and the same attraction for shoppers for miles around. Many recall how Hammonds restaurant was the place to be. Serving teas, coffees and lunches it was the stop-off to be seen in when shopping in the grand city streets. Hammonds twinkles under Christmas lights. Image circa 1950s. 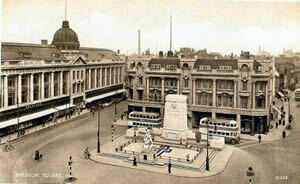 Changing its name permanently to House of Fraser in the years following it still stands on the corner of Paragon Square today. In June 2018 it was included in the list of 31 British stores under threat of closure and the city of Hull reeled. Inside the main doors is the beautiful Art Deco style staircase and wide, tall ceilings. As you look down the staircase to the basement there are two plaques set into the wall, retrieved from the rubble in May 1941. 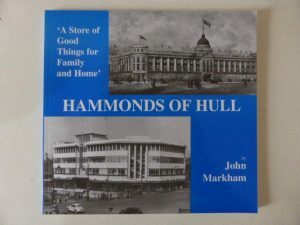 Read about Hammonds’ history in this book by John Markham. Childhood trips with parents, the view from Paragon Station, the way it rose up out of the earth to live again after the Blitz. It is a testament to its lasting heritage that the city still calls it by its original name. It is never House of Fraser, it is always Hammonds. We recommend you visit to see it for yourself and admire the great building and history held there. Next Post Book Review: Life In Hull From Then Till Now by Kay Pearson: A Fascinating Look Back on Women’s Lives.